Thanks for sharing that Ayslhyn. I enjoyed JRRTs's art the very first time I saw it. So much that I bought "Pictures By Tolkien" not long after reading his works. I still love looking at all of his paintings. 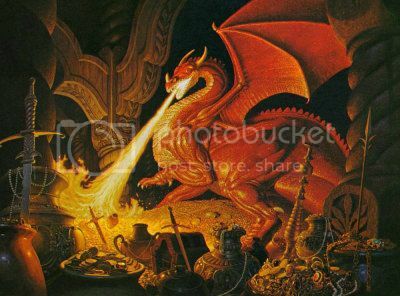 His "Conversation with Smaug" remains one of my all time favorites images. As does his cover art of my Silmarillion. Conversation is the wallpaper for my phone and a close-up of the Arkenstone for my iPad. He did a lot of wonderful and interesting artwork. Sadly, like many artists he is unskilled at human (or Hobbit) figures. I just got my Hobbit T-shirt of the map detail in today's mail. Very nice! I got a package from NZ! Whodda thunk it?